Page 3 - Brainstorm various attributes that you have that would be useful in a job. For example, you may be really good at time management and therefore would do well as a secretary that needs to manage various files at the same time. 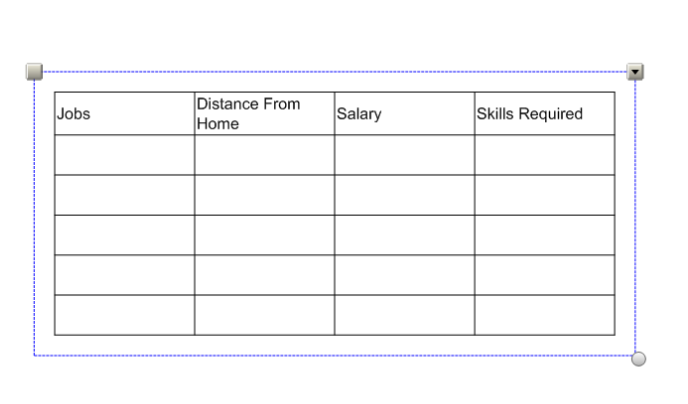 Create a table on the page and various jobs it may relate too. You should have at least things 3 things for each heading and at least 5 jobs that correspond. You may want to fill in your attributes first then think of jobs (If you don't know any jobs use google). Page 5 - Cover Letter - When we are applying for a job we generally submit a cover letter and resume. For this project you will only have to do a cover letter. See the attached Table. Choose one job from your search to complete a cover letter. Do your homework. Learn what you can about the company or organization you’re applying to, so you can tailor your cover letter and really show the employer that you could be a good fit. Follow instructions. Be sure to include any information that was requested in the job posting. If the posting asked for the amount of hours a week you are available to work, be sure to answer that question in the cover letter. Don’t just restate your résumé. Use your letter as an opportunity to make a great first impression. Most employers read the cover letter first, so you want to catch their attention by describing your impressive skills. That way, they are more likely to read your full résumé. Personalize your letter. When possible, address your cover letter to a specific person. Use their name and title, and make sure the spelling of the name is correct. Tailor your letter to the job. Make sure the skills and experience you highlight in your cover letter are clearly connected to the job you’re applying for. Presentation counts. Use a font that’s easy to read, like 12-point Times New Roman or Arial. Using 8.5 x 11-inch white paper is usually a smart choice. Break it down. Make your cover letter easier to read by breaking the text down into short paragraphs. Be brief. Your cover letter should be no more than one page long—the best strategy is to keep it short and to the point. Proofread. Review your cover letter several times; don’t just rely on spell-check. Ask someone else to proofread it as well.